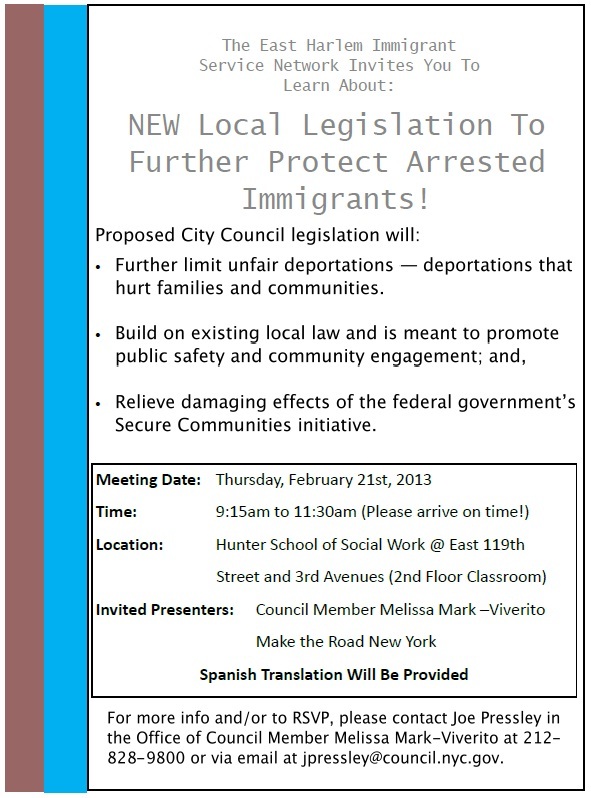 Please join Council Member Melissa Mark-Viverito, The East Harlem Immigrant Service Network and Make the Road New York in learning about new local legislation that will further protect arrested immigrants on Thursday, February 21st, 9:15 AM at the Hunter School of Social Work. Relieve damaging effects of the federal government’s Secure Communities initiative. WHERE: Hunter School of Social Work at East 119th Street and 3rd Avenue. Second floor classroom. For more info and/or to RSVP, please contact Joe Pressley in the Office of Council Member Melissa Mark-Viverito at 212-828-9800 or via email at jpressley@council.nyc.gov. This entry was posted in Blog, Citywide, East Harlem, Events, Legislation and tagged Deportation, East Harlem Immigrant Service Network, Hunter School of Social Work, ICE, Immigration, Legislation, Secure Communities. Bookmark the permalink. Thank you Melissa for leading the way in behalf of our immigrant neighbors.